(Beyond Pesticides, July 26, 2018) A legal complaint filed by a Kansas farmer claims industry giant, Monsanto, knew its new dicamba-formulated product would harm other crops, but marketed and sold it anyway, damaging thousands of acres of crops. The lawsuit, filed by 4-R Farms based in Corning Kansas, lost over 200 acres of soybeans. This is the latest in a string of lawsuits Monsanto is facing. Farmers in Arkansas, Missouri, and elsewhere have been hit with crop losses as a result of the dicamba damage. Advocates and victims of damage argue that Monsanto places profits ahead of possible damage to crops when it markets seeds resistant to a powerful weedkiller before making a less volatile herbicide available. This, according to the lawsuit filed in court. The petition, filed last week, could be the catalyst for a class action lawsuit of Kansas farmers against Monsanto, which faces a growing docket of legal challenges. The lawsuit also names chemical company BASF as a co-defendant. BASF is facing its own mounting pile of lawsuits over dicamba. The lawsuit requests unspecified damages and a trial by a federal jury in Topeka. Monsanto marketed its new line of dicamba products, Xtend, to go hand in hand with its genetically engineered (GE) seeds made to be resistant to dicamba. 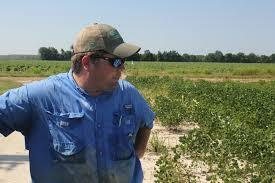 The goal was for farmers to treat their fields with dicamba to combat growing Roundup (glyphosate) weed resistance. The GE seeds were available first, without the accompanying dicamba product, and farmers were left to use older formulations. However, dicamba is highly volatile and can drift for miles impacting other nearby crops. The newly formulated pesticide was advertised as less volatile than previous versions. But as crop losses continued for the third straight year, this claim is turning out to be another false promise from Monsanto, as research by weed scientists found that the new product does volatilize enough to cause drift damage. “Defendants understood that such injuries would force farmers to defensively plant Xtend crops in future growing seasons and thereby increase the market,” the lawsuit claims. “I think now as hard as things are on farmers and producers with tariffs and other difficulties in the markets, any hit they take on what is traditionally their strongest cash crop is particularly hard,” said Lee Cross, the Kansas City, Mo.-based lawyer who filed the lawsuit. The 2018 harvest will reveal the extent of damages both in acres and dollars in Kansas and at the more than 1,300-acre 4-R Farms, according to Mr. Cross. Dicamba has not impacted Kansas as much as states to the east, like Missouri and Arkansas, where hundreds of complaints led to the states to take action on dicamba’s use. Already, Monsanto is facing a class action lawsuit in eastern Missouri from farmers alleging the volatile chemical damaged their crops. Nationally, the U.S. Environmental Protection Agency (EPA) estimated 3.6 million acres — or about 4 percent of American soybeans — were damaged by dicamba in 2017. The Kansas Department of Agriculture reported it received complaints of dicamba damage from more than 213 farmers last year, according to the lawsuit. Thus far, farmers across 10 states are suing Monsanto over dicamba damage to their crops. Steven W. Landers, et al v. Monsanto Company was filed on Jan. 26 in the United States District Court for the Eastern District of Missouri, Southeastern Division. Kansas City law firm Randles & Splittgerber filed on behalf of Steven and Deloris “Dee” Landers and similarly harmed farmers in 10 states—Alabama, Arkansas, Illinois, Kentucky, Minnesota, Mississippi, Missouri, North Carolina, Tennessee and Texas, according to EcoWatch. Farmers seek damages for claims including negligence, strict liability, failure to warn, conspiracy, disgorgement of profits and punitive damages. These cases contend the biotech giant knowingly marketed its Xtend cotton and soybean seeds to farmers without any “safe” herbicide. Recently, the Justice Department allowed two already large agrichemical corporations, Bayer and Monsanto, to merge, despite strong voices of opposition from grassroots advocates across the country, and investigations by state Attorneys General. Bayer is opting to ditch Monsanto’s name, possibly as soon as late summer, when the acquisition is expected to be completed. If you are concerned about the use of dicamba-based herbicides in agricultural areas where you live, contact your state department of agriculture and voice your concerns. Find their contact information through Beyond Pesticides’ state pages. For more information about the hazardous associated with GE agriculture, see our program page on genetic engineering. This entry was posted on Thursday, July 26th, 2018 at 12:00 am	and is filed under Agriculture, BASF, Dicamba, Genetic Engineering, Kansas, Monsanto, Pesticide Drift. You can follow any responses to this entry through the RSS 2.0 feed. You can skip to the end and leave a response. Pinging is currently not allowed.